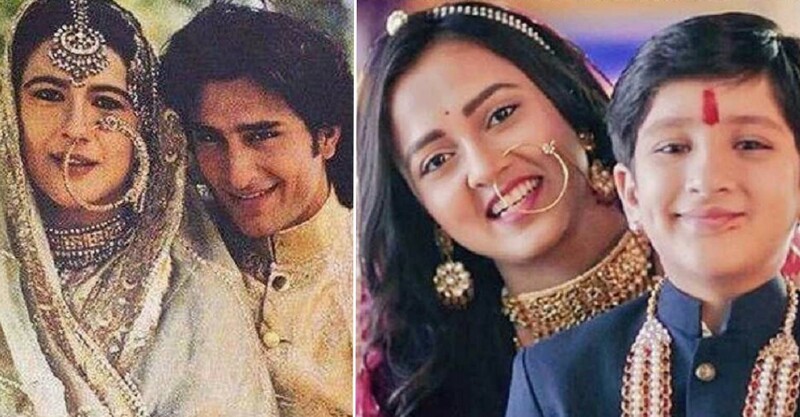 Pehredaar Piya Ki Compared Themselves with Saif-Amrita Marriage While Makers Look for Older Actors! Ever since its inception, Tejasswi Prakash and Afaan Khan’s serial Pehradaar Piya Ki has been the epicenter of the multiple discussions and controversies based on its reflecting of various social norms. Looks like the show has now found a new muse among trolls who have been busy mocking Amrita Singh and Saif Ali Khan’s wedding picture, putting it face to face with the daily soap. Recently, a picture of Amrita dressed in a traditional outfit of the Pataudi's surfaced on the Internet and Twitterati had a ball making fun of her huge nose ring in the picture comparing it to Saif Ali Khan’s Kada and some to the actress’s friend circle. Now the trolls have taken the meme game to the next level by comparing Sony Tv’s Pehradaar Piya Ki with the same picture. In the show, the bride is 9 years elder to her groom and in real life, Amrita was 12 years elder to her groom Saif when the two got married. And thus, the Twitteratis are now in full swing concluding kiddingly that the show has been inspired by the marriage of this couple and the number of memes dropping in is sky high. On the other hand, as per reports, the makers are planning for a 12 year time leap in the show and are busy looking for an actor to play the role of the 21-year-old Prince Ratan Singh. The time leap takes place in October. Currently, Afaan Khan plays the role of the 9-year-old Prince in the show. And considering how popular the show has become, as per sources a lot of people are sending in their audition tapes for the role. The selection criteria mandates that the candidate should be younger looking than Tejasswi Prakash, who plays the role of the said Prince’s wife. In fact, if some rumors are to be believed, the makers might also hold a mega countrywide audition for the role that will not open doors for actors from various parts of India to participate but also act as a huge image booster for the show itself. The source concluded by saying that the time leap was pre planned. The leap, according to the source, was always part of the script and has not been brought in recently due to the ongoing criticism that the show is currently facing.